THE scenic Mountain Road between Buncrana and Carndonagh has been left spick and span thanks to community-spirited volunteers from the Sliabh Sneacht Centre and Buncrana Tidy Towns. 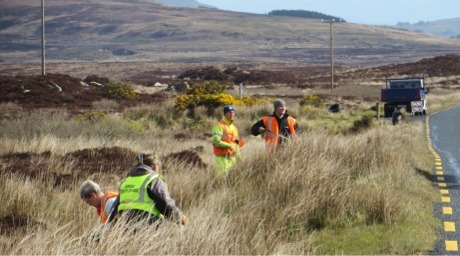 Some of the volunteers who helped clean up the Mountain Road between Buncrana and Carndonagh. 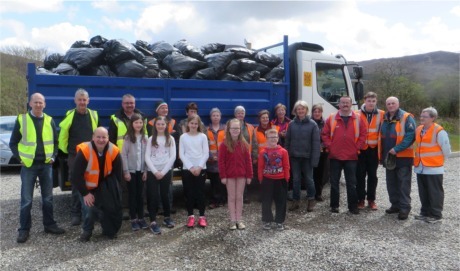 Donegal County Council litter warden Pearse McCrory praised the effort and revealed that some 150 bags of rubbish were collected along the road last Saturday during the countywide Big Donegal Clean-Up. "It was a tremendous effort by local people on terrain that is not easy to access at the best of times. “There was all types of stuff collected - from old tyres, to items thrown out of car windows. It is shocking to see the amount of recyclable material dumped when this can be easily recycled free of charge at one of the Council’s 72 bring banks around the county," he said. Pearse also paid tribute to Noel O’Donnell the driver of the council's litter van who spent the afternoon collecting the rubbish gathered by the volunteers along the route. The volunteers were treated to a well-earned cup of tea and refreshments in the Sliabh Sneacht Centre following the clean-up.